Practical gardening sessions with children, e.g. 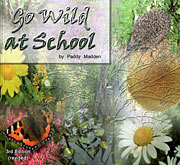 sowing, planting, native hedgerows, ponds, wildlife gardening etc. * Some facilitators are subsidised through the Heritage in Schools Programme. Contact each Centre for further details. Monthly school garden tips and simple seasonal recipes. A month to month guide throughout the the year with gardening tips and recipes for teachers and school children or for parents who want to get their children involved in gardening.